I have been musing a lot about the Byrne Supergirl and the early days of the Matrix. There are a couple of reasons why it is suddenly in the forefront of my brain. For one, this was about the most radical of reboots for Supergirl. While Loeb/Turner and Johnson/Green/Asrar were reboots, they were ... generally ... in line with the original origin. And Johnson and Green riffed completely on the anger/loneliness of the Loeb version. When you think about it, Kate Perkins and Mike Johnson sending her to super-school is nothing compared to Byrne's vision. Another reason is the return of Maxima to the DCU. Again, in the troubled early days of Matrix, both Supergirl and Maxima are working for Brainiac in Panic in the Sky, although both characters end up freeing themselves from his clutches by the end. 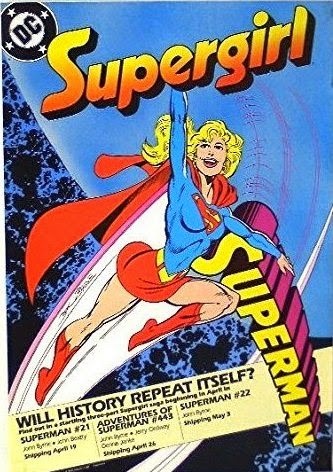 With Byrne's Supergirl on my mind, it reminded me of this promo poster which came out in 1988. At the time, I was absolutely floored. This was a classic looking Supergirl, smiling, joyous. I loved how Byrne drew her. And there was the image of her swatting away the Superman logo, the Bronze Age Supergirl logo at the top in its place. Absolutely beautiful. Of course, we know this was a protoplasm being, created by Lex Luthor, genetically mapped to Lana, with psionic powers, from a pocket universe. It was about as far from history as you can get. Still, I love this poster and wish I owned it! Because I can vividly remember seeing it in the comic store and wondering what it all meant! I've never seen this, it's great - but that line would've had me seeing a reference to Kara's death rather than the happy times. New Costume In Supergirl #38?